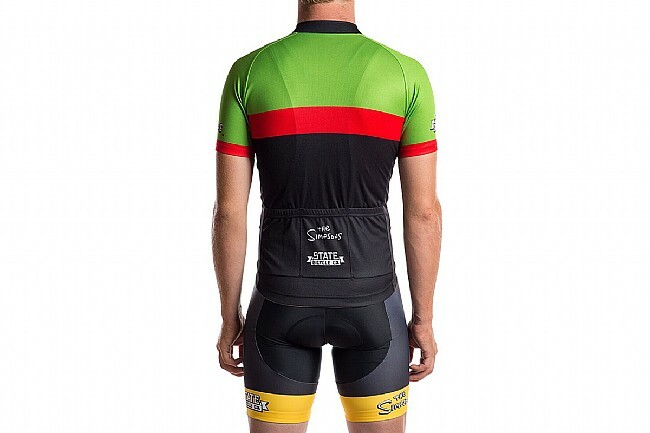 If you're a die-hard Simpsons fan, then you need to own one of the State Bicycle Co. X the Simpsons jerseys. 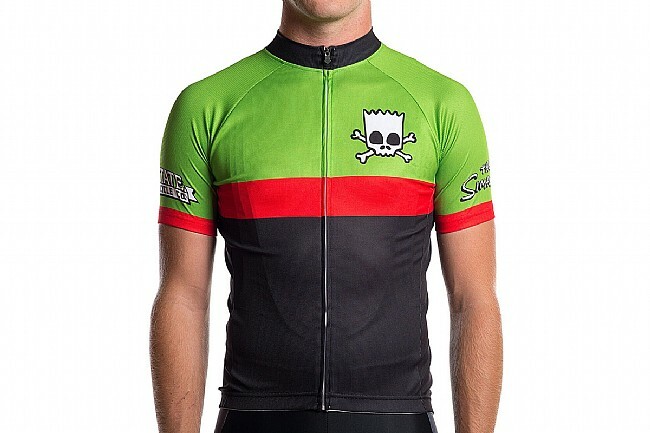 The Skull and Cross Bart jersey pays homage to everyone's favorite spikey-haired skateboarder with its bold styling. This full-zip jersey is constructed from a blend of polyester and CoolMax fabrics, offering supreme breathability and moisture management. The slim race fit keeps the jersey close to your skin, allowing it to wick away sweat and use it to cool you, rather than weigh you down. Three large pockets in the rear keep you well fueled and prepared for anything that gets thrown your way without sagging or deforming. Keeping everything in place is a silicone gripper at the waist. Don't have a cow, man, just enjoy the ride. Chest 32"-35" 36"-37" 38"-39" 40"-41" 44"-43" 44"-45" 46"-48"
Waist 26"-29" 30"-31" 32"-33" 34"-35" 36"-37" 38"-39" 40"-42"
Hips 34"-35" 36"-38" 38"-39" 40"-41" 42"-43" 44"-45" 46"-48"
Everywhere I go people are loving this jersey. Feels great when riding and fits perfectly. The price was right, just wish I'd purchased the next size up. The arms are especially tight.